From family heirlooms to treasured engagement rings, we want to make sure our jewellery is protected in the event it’s stolen, damaged or lost. 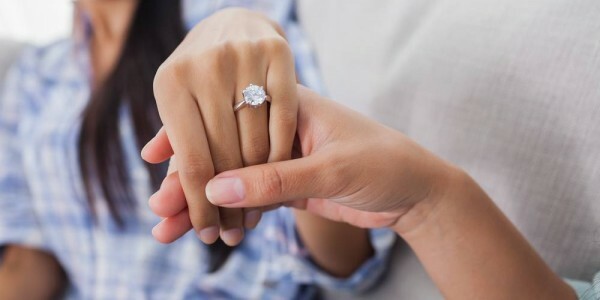 Although specialist engagement ring insurance and jewellery insurance policies do exist, it's possible to ensure your jewellery is covered under your home insurance. While your original jewellery may be irreplaceable, at least you’ll be protected. Do I need to add my jewellery to my home insurance policy? You will need to declare any jewellery as a ‘specified item’ on your home insurance policy if it’s worth more than £1,000. A specified item is any high risk item in your home. If your jewellery is worth less than £1,000, then it will be automatically covered under your home’s contents insurance policy. If you only have buildings insurance and don’t have contents cover, then you might want to consider taking out a contents policy. Not only will it cover your jewellery but it’ll also protect other valuables like TVs, laptops, bicycles and mobile phones. While your engagement ring is probably up there with the more expensive items in your home, its sentimental value is priceless. Traditionally, the person proposing was meant to spend three months’ salary on the sparkler, these days the average engagement ring costs anything from a few hundred pounds to tens of thousands. And because of the high price tag, it’s important your engagement ring is covered by your home insurance policy. Adding your jewellery and any other high risk items worth over £1,000 (think laptops, art, coin collections or musical instruments), to your home insurance policy means you have the option to cover the items at home or away. Items worn or carried around on a day-to-day basis can be covered ‘away from home’. Accidental damage cover for jewellery is something you might want to think about. If gems are lost from their settings or if you lose a piece of jewellery to the hoover or down the sink. While your jewellery may have been bought for a certain amount, that doesn’t mean it’s worth the same now – the value of gold and silver changes regularly, so it’s important to make sure that your jewellery is covered for its true value. As with a piece of valuable art, your jewellery must be covered for what it’s worth otherwise you’ll find yourself missing out in the event you need to claim. Make sure your jewellery is seen regularly as it appreciates and depreciates in value. To make sure you keep your engagement ring and jewellery in the best condition, we spoke to Head of Services at Goldsmiths jewellers for some top tips on caring for your jewellery. “As a rule of thumb, all gemstones should be kept away from liquids and chemicals to preserve their natural hues and lustre. Always remove jewellery when you’re cooking or cleaning to avoid contact with damaging oils and chemicals. “For pearls, always endeavour to keep them dry. The best way to keep them clean and in glimmering condition is to wipe them with a soft cloth at the end of each day, especially if they’ve been close to your skin. To preserve your pearls, always think of them as the ‘finishing touch’. Apply all make-up, hair products and perfumes before you add the pearls; this prevents contact with chemicals which can dull or erode them.